Contemporary art often allows you to take part as more than just a passive viewer. We feature five artists who invite you to speak, listen, draw, and perform. Some works provide a forum for encounters and discussion, others urge you to get creative. Or, if you prefer, just look and listen. You will find instructions to follow in each room. In the work by Danish artist Christian Falsnaes, the audience is given the leading role, literally. 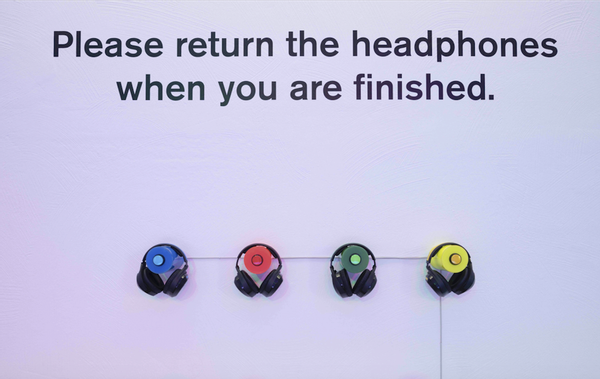 Wireless headphones convey instructions from the artist, telling the wearer how to behave and act on stage. a wall. Finding the right line can be challenging, especially when there are several persons on the line at the same time. an instrument rather than a mechanical device for transmitting information or amplifying sound. here, however, is a nearly three-metre-tall manikin that does not move except to blink its eyes. Visitors can leave their drawing in the space for others to see.